Wow! I was very crabby last week when I couldn’t take a photo of this weather vane? 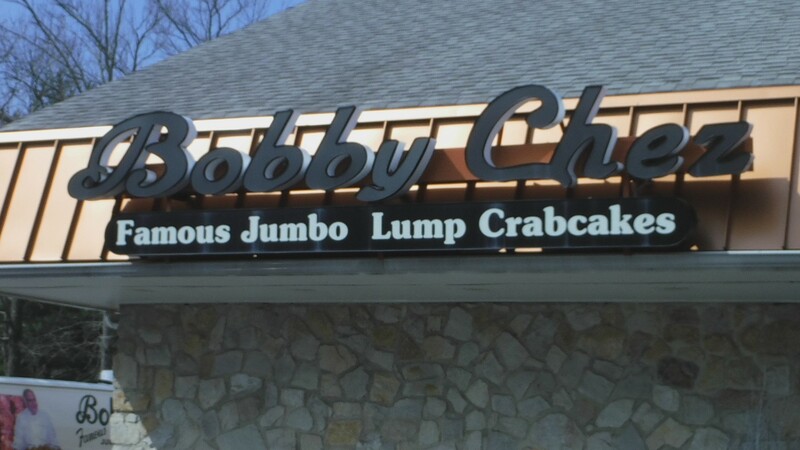 The next time I drove in the same direction I remembered my camera and took a photo of Bobby Chez Famous Jumbo Lump Crabcakes. Oh my! While I was there I bought two of their crab cakes to heat up for dinner; they were spectacular. The key to good crab cakes is to mix in as few ingredients as possible and let the jumbo lump crab have the starring role. I am delighted that I live in an area where fresh crab is readily available. 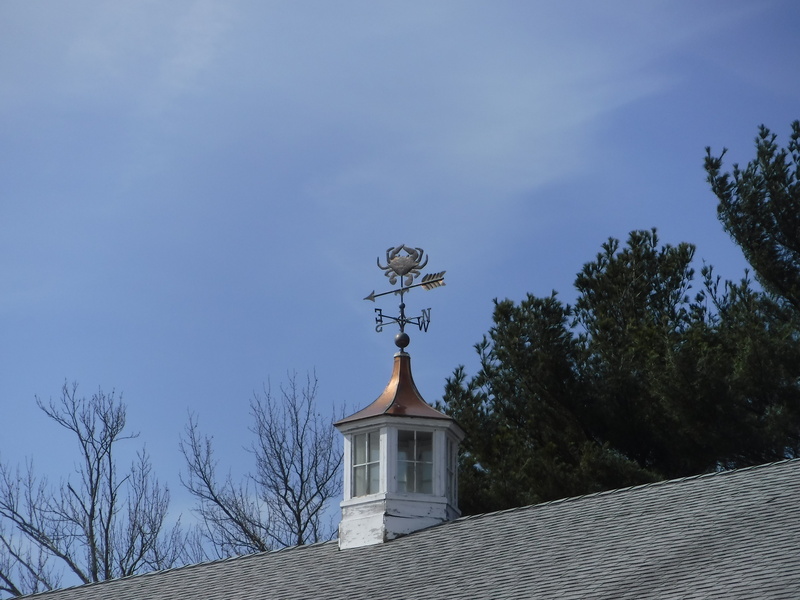 I go by this place almost weekly and only noticed they had a weather vane in the last few weeks. They have all kinds of amazing seafood and also a lot of great sides…mixed vegetables, gigantic trays of mac and cheese. A crab is certainly an unusual animal for a weather vane. How do you like my horses? The horses are sensational. I love the difference in the metals. I’ve found horses to be one of them most popular vanes, but usually not as beautiful and unique as the ones you have found. Thanks so much for taking part in the challenge. It’s appreciated. The crab vane is a first for me- glad you persisted and got the correct picture today. Crab cakes are great and your crabbiness last week is understandable. Thanks Susie, the warmer weather, a few pansy-like violas, and digging about in the soil has changed my whole outlook. Looks good. I’ve seen signs for Quantico on the way to DC, or is it after DC along 95??? Thanks for stopping by today. I lived in Easton, Maryland when I was a child. Maryland is a beautiful state. I’ve been wanting to take a trip to St. Michael’s once again. It’s been awhile since we’ve been there. We also love Elk Neck State Park and the town of Northeast. I love living in South Jersey. So many wonderful places are within a day’s drive. We lived in NE, 1967/68, small world. The wife’s parents retired to Elk Neck in 1964. Wildwood Crest was home to me 57/58, and the beat goes on. I love the town. We go to Hart’s Methodist for Easter sunrise service often…camp in Elk Neck overnight to get there on time. Once we drove down from our home in South Jersey.